Want to know what to pack for your Safari? Prefer a hard-copy version of this safari packing list which you are able to print off? Download our interactive PDF packing list here. This packing list calculates the total number of items you will require for the number of men, women, and children you have indicated above. Simply divide by the number of men, women, and children should you wish to work out the number of items required on a per person basis or, of course, set the number to one for each in the form above. Please also note that if your safari is longer than 12 days - and if you will have a laundry service available on your safari - that you should only take the recommended number of items for a 12-day safari or you will run out of space in your safari luggage. Comprehensive Tailor-made Safari Packing List & Safari Advice - for your safari: This is the ultimate safari packing list and we believe offers the best response to the frequently repeated question "What should I pack for my safari to Kenya, Tanzania, Rwanda, Uganda, Mozambique, Zambia, Namibia, Botswana, Zimbabwe, and South Africa". This safari packing list has been a decade in the making. Why do we spend so much time thinking through and creating our safari packing lists to ensure that they are the best out there? In a sentence: we are dedicated to ensuring that you have the most incredible time on safari and packing the right safari clothing, safari luggage, safari binoculars, and all the other important safari accessories is key to this. This is the new version of our general safari packing list and it is a list of the essential safari clothing and supplies which you should not leave home without. The list has been made by our safari packing list experts to ensure that you pack the correct safari clothing and gear for just about all types of safaris: game drive safaris, walking safaris, canoe or paddling safari, horse safaris (don't forget your riding gear if not provided by the camp), and gorilla safaris & mountain trekking. As a general introduction to the safari experience, most safaris start early in the morning and will be on open safari vehicles with little protection from wind and rain. The rule of thumb is to dress in layers for all activities. For more in-depth information on what to pack for your safari - and why - we recommend that you read through our safari clothing advice, safari luggage advice, safari binocular advice, and our safari accessories advice pages. To find out what our experts have to say about each recommended item, please simply click on "more info" and following the advice link. We have also included accessories you may need for add-on safari activities such as gorilla safaris, plus everything else you will need to remember to pack in your bag. Please also read our "top tips" section for handy insider information on the guidelines for packing for a safari and visit our expert advice pages too. Read our advice on why you should pack a smaller safari bag for your safari. View our range of the ideal safari-suitable small bags. Click here to view our range of Small Safari Bag for Game Drives, Walks, and Safari Activities. Always take spare batteries and make sure you pack chargers for your smartphone, torch, camera, laptop, tablet computers, and any other electronic devices. Our rule of thumb is to always take more batteries than you think you will need - and the same is true for memory cards for your photographic devices. It would be very sad to run out of power and memory on your camera halfway through your safari. Also investigate what power source will be available to you for charging devices while you are on safari. 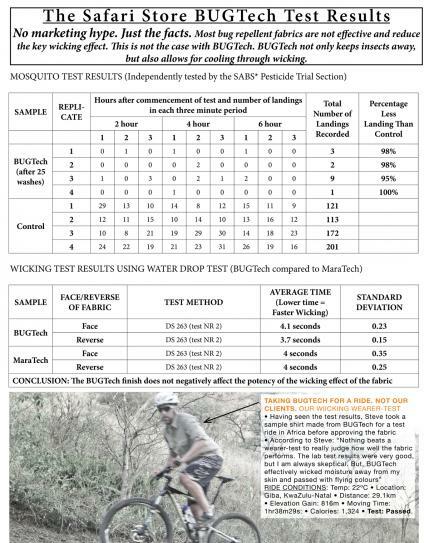 Bad chafing - as with bad blisters - may make your walking or active safari very uncomfortable. We recommend that you wear a pair of anti-chafe running tights under your safari trousers or safari shorts just to make sure that your inner thighs do not chafe. The forests of Rwanda, Uganda, and eastern Congo where the last remaining mountain gorillas are found can be challenging, thickly-vegetated places to go trekking. As this vegetation is made up of all sorts of plants with thorns, serrated leaves, and sword-like fronds, it is advisable to pack a pair of gardening gloves so that you do not cut your hands as you scramble up steep slopes and pull back bushes to make your way in search of these elusive great apes. For water-based safaris such as canoe safaris, boating safaris, green-season safaris, and dugout/mekoro safaris, pack your valuables into one of our smaller safari bags and then pack that into a waterproof dry-bag to keep your essential safari gear dry. We recommend that you first test your dry-bag by filling it with tissue paper, closing it, and submerging it under water in your bath or a pool. If the tissue gets wet, then try re-sealing your dry-bag or get a better dry-bag. Get extra protection for your ankles and your socks by using ankle gaiters. Shop ankle gaiters for your safari. While safari-coloured clothing is ideal to wear when travelling to your safari and relaxing around camp, sometimes nothing beats a crisp white shirt to wear around camp or to dinner at night. When our founder, Steve, used to work as a safari guide, this is exactly what the guiding team used to do for dinner. After a long hot day in the sun, take a long bath or refreshing shower and put on a crisp white shirt or a stylish blue travel shirt for the evening to look and feel great. Packing extra safari shirts will, of course, depend on how much space you have left in your safari luggage once you have packed the essential safari clothing and gear. View our range of non safari-coloured shirts here. Note: If space is limited, only take an extra non safari-coloured shirt and wear it with your safari trousers or shorts. While safari clothing doubles well as everyday clothing to wear when you travel and relax around the camp in the evenings and during the day, pack casual trousers and/or shorts if space allows. While safari clothing doubles well as everyday clothing to wear when you travel and relax around the camp in the evenings and during the day, pack casual shirts and/or t-shirts if space allows. Also see "non-safari shirts for travel and around the camp" on this packing list. Many lodges have a pool and it is great to be able to take a dip during the day. The estimated underwear quantity to pack is based on being able to wash underwear quickly and easily. If you sleep in pyjamas, pack one or two pairs. Most top-end safari lodges do provide gowns should you opt out of wearing pyjamas on safari. A safari-coloured kikoy is very useful to pack for your safari simply as they are very versatile. Wear your kikoy as a scarf, on your head, or even as a skirt or dress. They are very useful for around the pool too. If your safari camp or lodge has a gym, then by all means pack your gym clothing to stay fit on safari - and to counter all that delicious safari food and drink you will be served. If you enjoy running, then some lodges may be able to take you for a run with one of their fitter guides - at your own risk of course. The way this would usually work is that you would drive in a safari 4x4 game-viewer to a big open plain or to the airstrip and then your guide would run with you while someone drives the safari 4x4 game-viewer close behind you. Be sure to drink lots of water whenever you exercise in Africa as safari areas are often high above sea level and, if you exercise at midday, then pretty hot too. It is also a good idea to take some rehydration sachets or drink tea before and after exercising. Read our expert advice on why you may need a waterproof safari layer for your safari, when it rains in Africa. View our range of waterproof safari layers for men, women, and kids. For your safari, always ensure that your passport has two blank pages and is valid for 6 months after the end date of your safari. Double check visa requirements and find out whether or not you are easily able to get visa on arrival at your safari destination or if getting visas beforehand is advisable. Leave yourself with enough time before your safari to obtain visas should they be required. Keeping a certified copy of your passport with your travel documentation and separate to your passport may come in handy should you lose your passport. If you have more than one nationality and passport, we advise that you travel on safari with both just in case one goes missing so that you are able to prove who you are. If you have another form of identification such as an identity book or driver's license, then travel with this also. Keep this separate to your main passport. Another option is to leave your spare passport at home with a trusted family member or colleague for them to courier to you should your passport go missing on safari. Pack your health card and travel insurance details for your safari - and let your health insurer know that you are travelling to Africa. They will usually ask you for the dates for your trip too. Double check that you are covered for repatriation and medical expenses should anything go wrong while you are on safari. We advise that you take hard copies for your air tickets and hotel and travel vouchers on safari. Paper does not run out of battery life, whereas smartphones do. We find that Visa is most widely accepted in Africa, but note that not all lodges accept credit cards, so it is best to find this out from your lodge or tour operator before you travel. Take a calculator on safari or use your smartphone for conversion calculations. We prefer to use credit cards where possible, but taking some smaller denominations of US dollars is always a good idea for tipping and any emergencies. Opt for mostly US$5, $10, and $20 notes with a few $50 notes just in case. Do not travel with large sums of money, however, and note that many countries in Africa have cash points (ATMs) where you will be able to withdraw local currency too. Again, however, don't overdraw as you do not want to be heading home with a wallet full of a currency you cannot use. It would be a pity to travel all the way to Africa but forget to pack your glasses. Pack them in a hard suitcase so that they outlast even the roughest safari transfer or game drive - and also pack an extra emergency pair just in case you drop yours. Take along a small selection of good safari guides books, maps, and fiction and non-fiction books which cover areas which interest you. You will add to the enjoyment of your safari by being able to read up on the wildlife you view while on safari - and you will have lots of spare time between morning and evening safari activities. Always keep in mind the luggage allowance and how much you are able to carry on active safaris such as walking safari. Shop our range of safari books and safari maps. In our interview with Steve Backshall, he rated super glue as the one thing he won't leave home without: "I always carry superglue. That's my number one tip because it's fantastic for covering up blisters, for covering quite decent sized wounds - it can be used as a really good dressing - and then obviously you can use it to stick your fingers to your face if you feel like it or stick bits of your gear together or stick the sole of your boot back on if it's coming off". Note: we are not so sure about the advice to use it as a dressing, so please do not do this. Rather get your lodge to assist you with their full medical aid kit. As a team, we sometimes do and sometimes don't take malaria medication. We always recommend that you discuss where you are going and the recommended medication to take with your medical doctor. Only if needed for light aircraft flights on safari. Only pack lip balm for your safari if you use it regularly. We find that, by using it, you need it but, if you don't use it, then your body does a pretty good job of looking after your lips. Most safari camps have shampoos and conditioners available in your room, but you may prefer to use your brand of choice on safari. While some of our safari shirts feature silverplus technology which will keep your shirt smelling fresh for longer - always take deodorant. We usually pack roll-on simply as it lasts so long and is less bulky. This isn't usually something which safari lodges offer in their room so pack your toothbrush and favoured brand of toothpaste on your safari. This is something we always take with us as it is surprisingly useful beyond being great from getting stuff out from between your teeth - it can be used as emergency twine too for repairing safari clothing, safari luggage and so on. Pack your hairbrush and comb for your safari - and hair straightener should the lodge have electricity. Or take a break from your routine and let your hair go a little bit wild. If you are not sure about the availability of electricity at your safari lodge, then either find out from the lodge or take a normal razor and shaving cream. Tweezers on safari are very useful not only for preening - annoying splinters on an active safari could hamper the enjoyment of your safari. With many safari areas high above sea level - and with all that dry dusty goodness - you may wish to moisturise your hands and body. Take sufficient amounts for the length of your stay in Africa on safari. An African safari can be dusty so pack extra contact lenses and fluid. 5. As we all prefer to smell fresh, select safari clothing that uses an anti-microbial or anti-bacterial fabric. This also means that you will be able to wear the same safari clothing for longer and so pack less and travel lighter. 6. Add to the protective performance of the safari clothing which you take on safari by packing a wide-brimmed, packable safari hat, an effective sunscreen, and insect repellent which has been proven to work to spray onto your safari clothing, safari hat and skin. 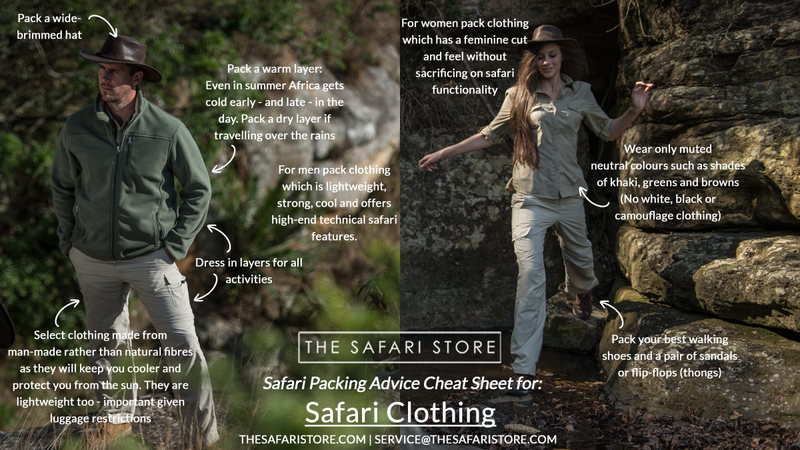 Use our safari clothing packing advice guide above for handy tips on what clothing to pack for your safari. VISA: If you require a visa and want to get it beforehand, make sure that you apply for the visa as soon as possible. PASSPORT: Check that your passport has sufficient pages as most African countries require two blank pages or more, and that your passport does not expire within 6 months. Apply for new passport if needs be. PAY: Make sure that you have settled your balance due for your holiday with your tour operator. SAFARI SUPPLIES: This is a good time to also contact The Safari Store for advice on what to pack, and to obtain your safari essentials (as above) in good time. PETS, HOUSES ETC: Make sure you have made arrangements for your pets, booked a house sitter, and any other arrangements you may need to make for post, services and so forth. PACK: If you are organised, this is a good time to start packing for your trip. Ensure that you have all the correct safari clothing and luggage from The Safari Store - and don't forget to pack the BIG 5 Essentials (first page of this list, on the right). If you require any further supplies, contact The Safari Store. Also work out what you are taking as hand luggage, and what will go into the hold. TELL: Tell your bank & credit card provider that you are going away so they know to expect transactions from outside your home country; Let your mobile phone company know too, and set up your preferred setting for roaming; Remind friends and family that you are going away - passing on your itinerary, with hotel/lodge/camp contact details to people involved in managing your affairs while you are away is also a good idea. CONFIRM: Taxis, train times, pet & house sitters. This may also be a good time to check on exchange rates for the country you are going to. NICE & RELAXED: With the proper preparation this should be as simple as picking up your luggage and travel documents, locking the front door, jumping into your taxi, or walking to the train station, checking in and taking off. Allowing yourself sufficient time to check in at the airport is vital in reducing the stress of travel. Arrive early, rather than late!